While working through the Plyometrics DVD yesterday morning, I noticed the sound kept fluctuating: loud, soft, loud, soft. I wonder if this is a defect in my DVD or it reflects the amount of oxygen reaching my brain at any give point in time. It IS Plyometrics, after all: the MOTHER of all P90X workouts! So while I’m breathing and bouncing around in a quasi-anaerobic state, I start free associating and my marketing degree kicks in. Beachbody has a great product with the P90X DVD set, but the DVD sale alone is a one time thing. You need supplements, equipment and accessories to build a predictable annuity stream. Beachbody has made relatively good progress to this end with the chin up bar, Recovery Drink, Shakeology and the like. But I think they’re leaving too much on the table. As my loyal readers know, I’ve already suggested an Exercise Magazine and a Recovery Sundae. Unfortunately, both suggestions seem to have fallen on deaf ears. I’m not dissuaded, however, for mine is a rich and fertile mind! At the beginning of Plyometrics, Tony advises everybody at home to “keep your bucket nearby, because this routine is X-city.” What bucket? 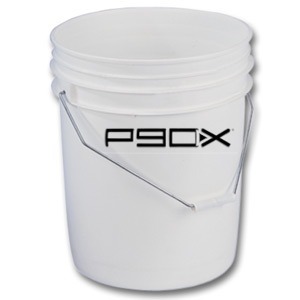 How about the P90X bucket: $39.95. And, indeed, Plyo X is a tough workout. Everyone on the DVD is wearing a heart rate monitor, which you can also purchase from Beachbody. But why stop there? 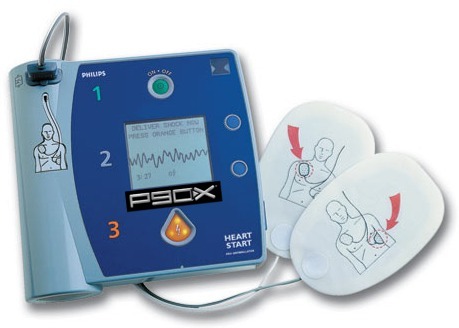 I think Beachbody should also offer the P90X AED…no home workout area should be without one. This way, if you inadvertantly get out of your zone, attempting to “Bring It,” you have access to the AED to help get you back in a better zone. I only offer up these suggestions because I’m truly a fan of the program. Though some residual checks for sales of these product ideas would be appreciated as well. I got Plyo X in early yesterday because I had a rain delayed doubles tennis match scheduled for 7:30 pm. My partner and I arrived determined to climb out of the 3-5 hole we had dug ourselves into before the rain set in on Saturday. That pipedream ended fast. We lost the remainder of that game and set in a couple of minutes. The second set ended quickly, and disappointingly as well, with a loss of 2-6. The P90X factor in the match? None. I burned maybe 14 calories. The observant reader may justifiably be wondering at this point: “exactly how bad a tennis player are you anyway, Albert?” It’s not like I’ve been lighting up this blog with inspirational tales of heroic victories on the court. All I can offer in response is the humble assertion: I’m not that bad. Really. Singles tennis tomorrow–and with it the potential for redemption–if the rain holds off. This entry was posted in P90X, Round 1 and tagged Exercise Equipment, Food, Nutrition, P90X, Plyometrics, Push Ups, Tennis, Tony Horton, Tonyisms. Bookmark the permalink.